This affluent South London suburb boasts an array of stunning and super stylish homes! The Just Shutters Teddington team are passionate about interior design, and even more passionate about customer service! Therefore, you can rest assured that you will receive the perfect shutters for your home with the best service possible. Contact the team on 01932 500270. Alternatively book your home design visit or download a brochure using the buttons below. 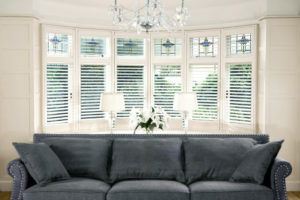 We stock one of the most extensive ranges of shutters in the UK. Couple this with the team’s passion for design, and the result is truly bespoke stunning shutters! However, there is more to shutter than meets the eye. Shutters are actually incredibly practical. This practicality comes as a result of many unique features! Features such as; being child safe, providing an additional layer of insulation and being very easy to clean. As a result, it is not hard to see why shutters are amongst the most desirable home furnishings! As a result of many reviews such as these, we have been awarded a 9.9/10 rating on Checkatrade.